The official Ground-Breaking Ceremony for the expansion of the Hanmer Valley Shopping Centre took place on Friday, September 24, 2004. On hand for the event were the four former mayors of Valley East and Capreol, in recognition of their work over the years in developing the community spirit which the mall is trying to keep alive. 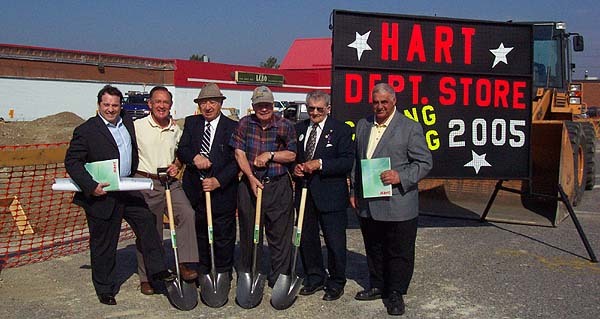 Shown in the photo, from the left are: Bobby Alfano, representing Hart Department Stores; John Robert, former mayor of the City of Valley East; Frank Mazzuca, former mayor of Capreol and also Regional Chairman; Howard Armstrong, former mayor of Valley East; Ray Plourde, the first mayor of the Municipality of Valley East; and Val Mazzuca, owner of the Hanmer Valley Shopping Centre. Hart Department Store will open up in their new 30,000 square foot space in March 2005. The Hanmer Valley Shopping Centre will be expanding by a total of 15,000 square feet directly out from the east wall. Construction began on September 16. The outer shell of the building is expected to be completed by the end of November, with interior work beginning shortly thereafter. This will increase the size of the mall to approximately 315,000 square feet of retail space. The Hanmer Valley Shopping Centre opened in November of 1963 and has undergone a number of expansions since then. The first was done in 1975 while Mayor Ray Plourde was in office and the last one took place in 1989. The mall is owned by Valentino & Violet (Val & Vi) Mazzuca. The expansion is being done to accommodate a brand new department store to the region, which will operate under the banner, HART. The first company store in the Hart chain was founded in 1960 in the rural Quebec community of Rosemere, just north of Montreal. By 1995, the chain consisted of 32 stores operating under the Hart, Geant des Aubaines, and Bargain Giant banners mostly in rural Quebec and Atlantic Canada. In 1994, the People’s Store chain, which had been a market rival, declared bankruptcy, providing Hart with a perfect opportunity to expand. In 1995, Michael Hart, the current President and CEO, acquired 32 of the best People’s locations and thus doubled in size to 64 stores in a two month period. This made the Hart/Geant des Aubaines/Bargain Giant chain a major player in the Eastern Canada region with stores in Quebec, New Brunswick, Nova Scotia, Labrador and Newfoundland. The Hart department stores range in size from 20,000 to 30,000 square feet and offer a truly impressive variety of fashion and basic apparel lines for every family member and consumers in all age brackets. National and exclusive brands are well represented in the merchandise mix, all at remarkably low prices for the quality offered. About 45 percent of the available floor space is devoted to a wide selection of home furnishings, housewares, giftware, toys, bed & bath and small furniture items. Family footwear is also well represented. Throughout the product mix, value-oriented pricing along with a strong promotional program, excellent customer service and strategic locations in high-traffic malls serving smaller communities has assured remarkable customer loyalty. The chain has been able to successfully focus on the grass-roots consumer through over 40 years of experience in developing a genuine feel for their lifestyle necessities. You will find that staff and management are both committed to customer satisfaction. Once the store has been established, it will employ about 25 full and part-time employees. Shoppers will find "box store" selection and prices, but "small store" service and attention. This is the alternative that Hart Department Stores work hard to maintain and has been one of the main reasons for its success. The Hart Store being established at the Hanmer Valley Shopping Centre is the company’s 2nd store in Ontario. The only other store is found in Kirkland Lake. Plans are in the works to open up to another four sites in 2005 as Hart Stores quickly moves to establish itself as a major player in this province. It is expected that a store will be opened in Whitby close to the same time that we are opening in Hanmer. The Hanmer Valley Shopping Centre was considered an ideal location for a Hart Store. The store will serve an immediate population base of almost 30,000 people, with upwards of 90,000 people from the City of Greater Sudbury visiting this community at some point during the year. The shopping centre is also very community focused, which fits in well with the marketing strategy of Hart Stores. One of the most important factors in the mall ownership being interested in bringing a Hart Store to the Hanmer Valley Shopping Centre is that the store will occupy a space which is large enough to provide a wide variety of merchandise to local residents. It is also a corporate enterprise which now contains 66 different store locations. The buying power of almost 2 million square feet of total selling space in the chain will ensure that the selection and pricing that Hart Stores will be able to provide will be of a level which will certainly benefit the shoppers of Valley East and Capreol, as well as visitors to our community. In fact, if you visit the web site at you will find that the store has several very important policies with respect to pricing. For example, Hart Stores guarantees in writing that their sales prices will not be beaten, or they will match the price. Refunds will be made without question for up to 15 days after purchase. Lay-a-ways can be made with a minimal deposit and then you can purchase the produce later at lower sales price levels. Hart even has what is called Club55, which means that anyone over the age of 55 will receive 15% discount off all merchandise in the store on the first Monday of every month. By bringing this mid-sized department store to the Hanmer Valley Shopping Centre, we are demonstrating our confidence in the community of Valley East by continuing to do our part to "Keep The Spirit of 100 Years of History Alive". We were extremely honoured when the four "pillars of the community", Mayors John Robert, Howard Armstrong and Ray Plourde, of Valley East, together with Frank Mazzuca, former Mayor of Capreol and former Regional Chairman of the Region of Sudbury, agreed to take part in our official ground-breaking celebration. Valley East owes a lot to these great men for their hard work in creating one of the finest places to live in all of Ontario. Valley East and Capreol offer a quality of life that many can only dream of, and now with the addition of a Hart Department Store to the 2nd largest indoor mall in all of Sudbury, local residents indeed have it all.